It will be a dry day with sunny spells and highs of 12C (54F). 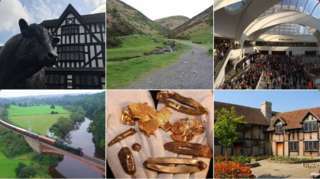 The latest news, sport, travel and weather across the West Midlands and south Cheshire. M6 Staffordshire southbound severe accident, from J15 for A500 D Road to J14 for A34. M6 Staffordshire - One lane closed and slow traffic on M6 southbound from J15, A500 (Stoke-On-Trent) to J14, A34 (Stafford North), because of an accident. M1 Leicestershire southbound severe disruption, from J19 for M6 to J18 for A5. M1 Leicestershire - Three lanes closed and queuing traffic on M1 southbound from J19, M6 (Catthorpe Interchange) to J18, A5 (Rugby), because of a lorry fire. M6 Warwickshire southbound severe disruption, from M6 J4 to J3 for A444 Bedworth Bypass Nuneaton. M6 Warwickshire - One lane closed on M6 southbound from M6 J4, Coleshill to J3, A444 (Nuneaton), because of a broken down vehicle. Traffic is coping well. M6 Staffordshire northbound severe disruption, from J14 for A34 to J15 for A500 D Road. M6 Staffordshire - One lane closed on M6 northbound from J14, A34 (Stafford North) to J15, A500 (Stoke-On-Trent), because of a broken down vehicle. A5 Shropshire northbound severe accident, from B4380 Thieves' Lane to A49. A5 Shropshire - A5 in Shrewsbury blocked and queuing traffic northbound from Emstrey Island to Preston Island, because of an accident. Congestion to A458. A5 Warwickshire westbound severe accident, between B4111 Harpers Lane and B4116. A5 Warwickshire - A5 in Witherley blocked and very slow traffic westbound between Mancetter roundabout and the B4116 junction, because of an accident. 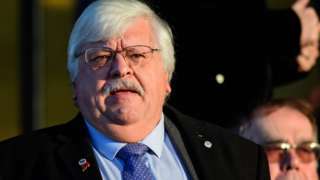 Norman Smurthwaite says he will put Port Vale in administration if a new owner is not found by his deadline of 5 May. M6 Staffordshire northbound severe disruption, from J12 for A5 to J13 for A449. M6 Staffordshire - One lane closed on M6 northbound from J12, A5 (Gailey) to J13, A449 (Stafford South), because of a broken down vehicle. Traffic is coping well. M5 Worcestershire southbound severe disruption, from J5 for A38 Droitwich to J6 for A4538 Pershore Lane. M5 Worcestershire - One lane closed on M5 southbound from J5, A38 (Droitwich) to J6, A4538 (Worcester), because of a broken down car. Traffic is coping well. A500 Staffordshire southbound severe disruption, near Olympus Engineering building. A500 Staffordshire - One lane closed and queuing traffic on A500 D Road southbound near the Olympus Engineering building junction, because of a broken down vehicle. M42 Worcestershire southbound severe disruption, at J2 for A441 Hopwood Park Services. M42 Worcestershire - M42 lane closed on exit slip road southbound at J2, A441 (Hopwood Park Services), because of a broken down vehicle. Traffic is coping well. 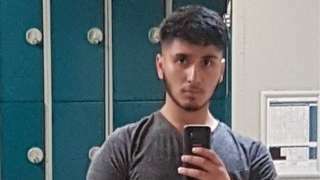 A 17-year-old is charged following the stabbing of a teenager in Birmingham. M6 Staffordshire southbound severe disruption, from J15 for A500 D Road to J14 for A34. M6 Staffordshire - One lane closed on M6 southbound from J15, A500 (Stoke-On-Trent) to J14, A34 (Stafford North), because of a broken down vehicle. Traffic is coping well. M42 West Midlands northbound severe disruption, at J6 for A45 Coventry Road Birmingham Airport. M42 West Midlands - M42 exit slip road partially blocked northbound at J6, A45 (Birmingham Airport), because of a broken down vehicle. Traffic is coping well. M42 West Midlands southbound severe disruption, at J5 for A41 Solihull By-Pass Solihull. M42 West Midlands - M42 lane closed on entry slip road southbound at J5, A41 (Solihull), because of a broken down car. Traffic is coping well. M6 Warwickshire southbound severe accident, from J4 for M42 J7 to J3 for A444 Bedworth Bypass Nuneaton. M6 Warwickshire - Slow traffic on M6 southbound from J4, M42 J7 (Coleshill) to J3, A444 (Nuneaton), because of an accident. 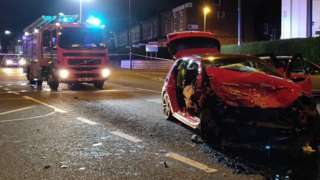 Five people are taken to hospital following a crash involving a people carrier and a car in Birmingham. M5 West Midlands southbound severe accident, from M6 interchange to J1 for A41 Birmingham Road West Bromwich. M5 West Midlands - One lane closed and slow traffic on M5 southbound from M6 interchange to J1, A41 (West Bromwich), because of an accident.